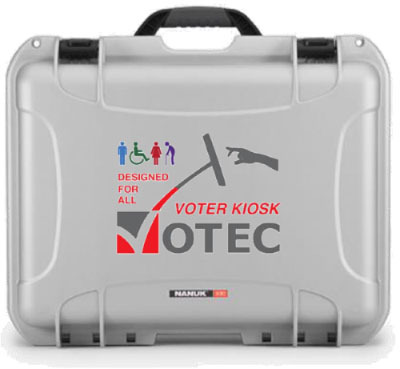 VOTEC’s WelcomeVoter Kiosk for voter check-in and verification enables election administrators to achieve a high level of usability, accessibility, security and functionality by implementing proven election management software—VoteSafe—into this evolved concept called the WelcomeVoter Kiosk. This universal design technology offers election administrators options to modernize the way voter check-in equipment is deployed and how voters are served. Voters using a WelcomeVoter Kiosk are provided tools for unique access empowering them to check-in to vote privately and independently. By utilizing the WelcomeVoter Kiosk, the voter is allowed to confidently and quickly move through the voting authorization process. Minimize mistakes resulting from verbal miscommunication. Eliminate problems caused by inconsistent and/or incomplete verbal instruction. Speed up voter when communication delays are minimized. Voter selects party-specific ballots in primary elections. Eliminate tilting / rotating a screen back and forth between poll worker and voter. All options and instructions are presented in all mandated election languages. The voter screen height is within ADA guidelines. Deliver a highly accessible solution for voters that require assistive technology. Assure each voter that they are identified and validated accurately. Make it easy for voters to specify corrections needed to their registration record. Our customers will also be benefitting from VOTEC’s more efficient, more reliable driver’s license scanning technology. We went the extra mile to develop the best glare resistance on the market. Everyone will appreciate the more reliable processing. 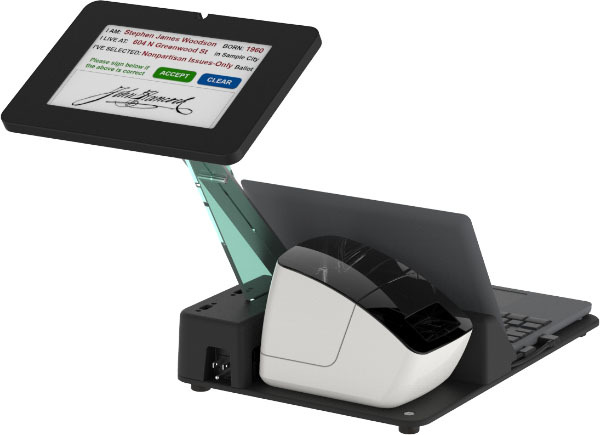 A rugged, expedition-grade case protects the WelcomeVoter Kiosk during transport. Between deployments this stackable case also enables recharging of WelcomeVoter Kiosk without removing it from its case.